Only at Stephen Wade Chrysler Dodge Jeep Ram and Fiat (435) 634 4220. 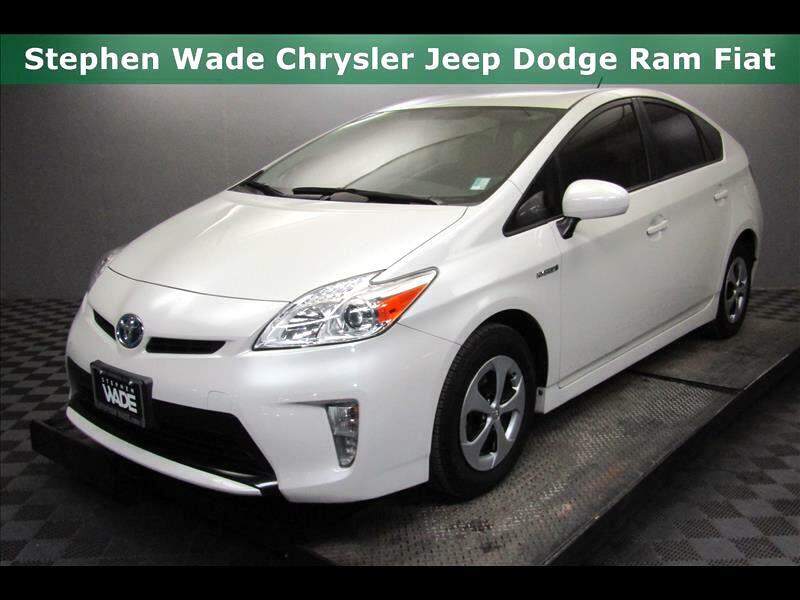 2015 Toyota Prius Two Prius Two, 5D Hatchback, 1.8L 4-Cylinder DOHC 16V VVT-i, CVT, FWD, Blizzard Pearl, Dark Gray Cloth, **SUPER CLEAN**.Clean CARFAX. Priced below KBB Fair Purchase Price! Reviews:* Superior fuel economy; abundant backseat room; spacious cargo area; comfortable ride; available high-tech options. Source: Edmunds* The world's first and most successful mass-produced hybrid car, the Toyota Prius hybrid continues to expand its dominance. If you're looking for the best fuel economy in the hybrid field, the Prius' 51cty/48 hwy mpg rating is still king. The plug-in model also allows for more options and with the ability to run solely on electric power at ratings of 95 MPGe. The driver is given a range of performance options via the EV, Eco, and Power buttons, which allow for variations in throttle application and fuel consumption. In EV mode, the Prius hybrid functions solely on electric power (speed and miles permitting), while the Power mode setting delivers the full potential of the gasoline engine assisted by the electric motor. The Eco mode setting is probably the most useful of the three, allowing the Prius' computer to modify the throttle response for the best balance of fuel consumption and performance. The Toyota Prius hybrid hatchback features an interior as modern and different as its exterior. The available Solar Roof is embedded with solar panels that can power a fan to circulate ambient air through the cabin when parked in direct sunlight. The contoured dash looks particularly handsome with its 2-tone panels. The Prius' sheet metal is designed to cheat the wind, with sharp-edged creases and flush glass panels. Even the car's wheel covers are aerodynamic. Available safety features include Dynamic Radar Cruise Control which can regulate vehicle speed when cruise control is engaged, a Pre-Collision System which can automatically apply brakes if collision is detected, and Lane Keep Assist which can give a warning notification or when Dynamic Radar Cruise Control is engaged it can gently correct steering. Source: The Manufacturer SummaryNew Price! Odometer is 6828 miles below market average! 51/48 City/Highway MPG Awards:* 2015 KBB.com 10 Best Green Cars * 2015 KBB.com 10 Best UberX Candidates * 2015 KBB.com 10 Best Hybrid Cars Under $30,000 * 2015 KBB.com 10 Most Fuel-Efficient Cars Under $25,000 ***SWAG PRICE INCLUDES DEALER CHRYSLER CAPITAL FINANCE SAVINGS AND IS VALID ONLY WITH 100% FINANCING THROUGH CHRYSLER CAPITAL. *Online Prices Only Available Upon Customer Request and Employees, Former Employees and Friends, Family, Vendors, of Stephen Wade, Dealers and Wholesalers may not Qualify for Online Pricing. Contact Dealer for Details. All offers are subject to change at any time. Certain vehicles may have unrepaired safety recalls. Check nhtsa.gov/recalls to learn if this vehicle has an unrepaired safety recall. Inventory shown here is updated every 24 hours. Visit Stephen Wade Auto Center online at www.stgcars.com to see more pictures of this vehicle or call us at 435-222-7605 today to schedule your test drive. The price for this vehicle as equipped does not include charges such as: License, Title, Registration Fees, State or Local Taxes, Finance Charges, Optional Credit Insurance, Physical Damage or Liability Insurance, or Documentary Service Fees of $299.00. Dealership makes no representations, expressed or implied, to any actual or prospective purchaser or owner of this vehicle as to the existence, ownership, accuracy, description or condition of this vehicle's listed equipment, accessories, price or any warranties. Any and all differences must be addressed prior to the sale of this vehicle.